The weather may have been grey and murky on the Solent today, but the quality of racing at the opening day of the 2012 Vice Admiral's Cup was spectacularly vibrant. For the 71 teams in six classes the day brought light to moderate shifty winds of circa 6-12 knots combined with a strong ebb tide, giving tacticians and navigators plenty to think about. Race Officer Bob Milner set up shop for Classes 0, 1 and 2 along the Ryde bank, while his colleague Robert Lamb took Classes 3, 4 and 5 up onto the Hillhead plateau. All fleets were sailing windward leeward courses and the race committee succeeded in completing the three races scheduled for all classes. In the overall standings Class 0 is led by Jonathan Goring's Ker 40 Keronimo, Class 1 by the British Keelboat Academy's Kolga, Class 2 by David & Kirsty Apthorp's J-Dream, Class 3 by Steven Tapper's Stalker, Class 4 by Rick Melander's Alice II and Class 5 by Oleg Zherebstov and Rodion Luka's Team Russia. 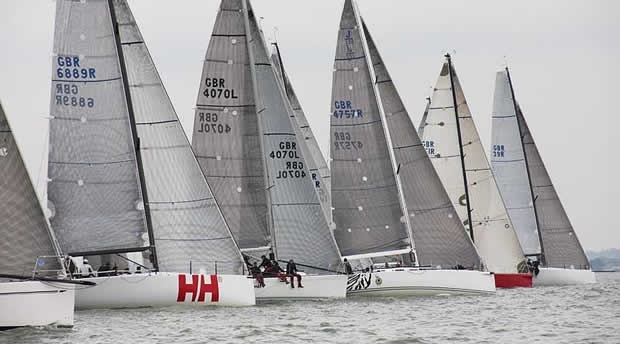 In Class 0, featuring the 17 triallists for the GBR Team at the 2012 Brewin Dolphin Commodores' Cup, it soon became clear that no quarter would be given in the battle for places. No one team dominating the results and three boats are now tied on points at the top of the leaderboard. Paul McNamara and Tony Lowe's Incognito got off to a good start winning the opening race, but followed this up with a 9th and 10th dropping them down to 6th overall. Third race winner Dignity, owned by Andrew Williams, took an 8th in race one and 4th in race two while Mike West's Eaujet turned in a very handy 2,6,5 scoreline, giving them 13 points apiece. Following a disappointing 10th in race one, Keronimo took race two and followed up with a 2nd in race three to put them on equal points with Dignity and Eaujet. On count back Keronimo takes the overall lead with Dignity second and Eaujet third. After racing Jonathan Goring confirmed that his overall impression of the day was: "Incredibly shifty! The wind was veering right all day and there was a massive 90° shift just before the third race. Our boat is the highest rating in the fleet so we're constantly looking to pick our gap and find clear air. The tide played a crucial part too although at times, particularly in the first race, it was hard to decide what to do for tidal advantage. We got forced off to the right into more tide and expected to loose out, but at the first mark we'd gained on those who came up the bank! This is a crucial regatta for those of us hoping to be selected for the GBR Team and the Commodores' Cup so we're crossing our fingers for more breeze tomorrow." Class 1, for 44-45ft series production boats, may have had only six entrants, but what they lacked in numbers they more than make up for in quality. Boat of the day was the British Keelboat Academy's Kolga which won the first race and followed up with a pair of second places to lead the regatta by five points. Jerry Otter's Werewolf took a third in race one and won race two but a disappointing sixth in race three leaves them in second overall, just one point ahead of Tony Langley's Atomic. After racing Atomic's jib trimmer, Richard Mason Jr, concurred with Jonathan Goring's assessment that the day was super tricky saying: "It was seriously shifty but the race committee gave us good courses with a long first race followed by two shorter ones. We had good speed and our decision making on the course was good, but our positioning on the start line needs work. None of the guys has sailed a 45 for a while so we're finding our feet again and our tactician Ben Sexton is racing in his first truly grand prix big boat regatta - its been a steep improvement curve through the day." In Class 2 for the J/111s David and Kirsty Apthorp's J-Dream won the first and last races and came 4th in the second, while James Arnell's Jeez Louise scored 3, 1, 2 leaving the boats tied on six points overall with J-Dream claiming the lead on count back. Duncan McDonald and Phil Thomas's Shmokin' Joe sits in third place overall, two points being the leaders, thanks to a second and two third places. The fifteen J/109s in Class 3 put on a great showing with some exciting racing that got so close at times that the Protest Committee had two protests to resolve after racing. Steve and Jody's Maine's J2eau took the honours in race one from Christopher Palmer's J-Taime with David McGough's Just So 3rd. But it was Steven Tapper's Stalker that claimed the boat of the day prize thanks to a 4th in race one followed by wins in next two races. In the overall standings Stalker now has a two-point lead over J2eau while Jonathan Hearth's Jagerbomb takes third place on 11 points with J'Taime fourth on 16. The ten strong revival Quarter Ton Class was delighted to welcome back past ISAF Vice President George Andreadis, who returns to the Quarter Tonners after 21 years, aboard his 1991 Rob Humphries designed Atalanti IV. This boat was built specifically for the 1991 Quarter Ton Cup, where she finished sixth and was put into storage following the event. She has recently undergone a major refit over the winter and is now looking absolutely fabulous. On the water George proved he hasn't lost his touch by taking two 2nds and a 5th, putting him in second overall, six points behind Rick Melander in Alice II who swept the board with straight bullets. One point behind Atalanti IV is Louise Morton's Espada and Sam Laidlaw sailing Aguila lies fourth. Eighteen boats are competing in Class 5 - the newly renamed SB20 class (formerly the Laser SB3) - where Team Russia made an impressive fist of the first day with a second and two firsts. Jerry Hill's Sportsboatworld.com gave them a good run for their money but had to be content with a 3, 2, 2 scoreline putting them 3 points behind the Russian's in second. Henri-Lloyd/Forelle Estates, owned by the Llewellyn/Wakefield/Virgus syndicate, won the opening race of the day, but then had to be content with a 7th and 4th putting them into third overall. Three further races are scheduled for all classes tomorrow with a planned start time of 10.30am. The regatta continues until Sunday 20th May with a total of eight races possible. Tomorrow's forecast is for brighter, dryer conditions although the light to moderate winds are likely to continue with around 6-8 knots from the south west. Once again the Vice Admiral's Cup is supported by long standing sponsors North Sails, Musto and Boat Sales International, and for 2012 we are delighted to welcome new sponsor Pascall Atkey The generous support of these sponsors is vital to the ongoing success of the event.